If your looking for a residential or commercial dumpster to rent, your most likely about to tackle a fairly big project. Whether you are moving, cleaning out your garage, remodeling your home, or are working on demolition job, nothing will make these projects flow in a convenient manner than renting one of our roll offs. Tin Tipper is looking forward to the opportunity of making your life a little easier. At this time we are able to serve the following areas : Fort Myers, Cape Coral, Sanibel, Punta Gorda, Lehigh Acres, Estero, Bonita Springs, Fort Myers Beach, Port Charlotte, Alva, North Fort Myers, and Pine Island. Our mini residential safe dumpsters will provide many benefits that other companies simply cannot compete with. Here are five reasons to rent from Tin Tipper for your next container rental. From the first time you pick up the phone and call Tin Tipper, the most cost effective option for dumpster rental in Fort Myers, FL, you will speak directly with the owners, respectful and courteous customer service can be expected. Our knowledge can provide you with all of the information to help you make the best decisions regarding your dumpster rental size, how to reserve you bin, and when you can expect your container delivery. Our residential safe dumpsters make any residential or commercial project easier to accomplish. With our fill swinging doors, you will be able to load heavy junk without breaking your back. A swinging dumpster door will enhance the access to efficiently stack your waste and debris to use as much space as possible. Your project needs a safe atmosphere to increase your project's productivity. Having a dumpster on site will help to keep all of your dangerous debris out of the way, keeping the public and you employees safe in their work environment. By renting a Dumpster, you can reduce your liability of a potential injury claim. 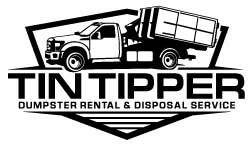 Tin Tipper Dumpster Rental is committed to respecting the environment as much as we respect our customers. When Tin Tipper disposes of garbage and debris, it is done properly, This also ensure to keep overweight disposal fees to a minimum. What you see on our pricing page, is what you will pay! The only time you will be charged extra is for any weight over 2 tons, and any rental length greater than 10 days. All of this is CLEARLY spelled out on our page! We only provide clear cut info on our rental pricing. When you need a container dumpster that is affordable and in most cases delivered the same day, call today at (239) 677-3525 and speak with us to help you fascilitate your next Tin Tipper dumpster Rental, the best Cape Coral dumpster rental company. Ready to Rent a Dumpster from Tin Tipper ? Check out our dumpster pricing and rental information page!